E-DataAid provides data editing capabilities from editing a single cell to adding a new variable. Editing a single cell is as easy as navigating to that cell, entering the new value, and pressing the Enter key. To preserve the hierarchy of the data, E-DataAid does not allow the user to edit log-level values below the session level. Although log level variables may be renamed, the cells are gray to indicate that they are read-only. If any other cells are displayed in gray, this indicates that the experiment Administrator has placed security restrictions on the file and has set the cells as read-only. Like other popular spreadsheet applications, E-DataAid provides common commands, such as Find, Replace, Fill Down, Copy, and Paste, to make the chore of editing many cells easier. Since these commands are not unique to E-DataAid, time is not spent describing them here. All edits to a cell appear in red, and for each edit, E-DataAid writes an annotation to the file (see E-DATAAID: Understand the Audit Trail . Even if performed within a group operation, such as Replace All, E-DataAid will write an individual annotation to the file for each edited cell within the operation. For example, if a Replace All operation edits three session-level cells, E-DataAid will write three annotations to the file – one for each edit. Notice that an edit that is made at a higher level is propagated down throughout the file. For example, each session- level edit appears in every cell in the worksheet that is associated with that session: when you replace the session number, for instance, every block and trial row within the session shows the edited value). While this type of record keeping is necessary for a complete history of modifications, the number of annotations can quickly become very large, depending on the number of edits made to a file. To make the list of annotations more readable, refer to E-DATAAID: Understand the Audit Trail  for information concerning filtering the annotations list. In E-DataAid, a cell or group of cells is deleted by using E-DataAid’s Delete command on the Edit menu. Cells with deleted data or no data are marked as NULL. E-DataAid requires the use of the Delete command to delete data. When data is deleted, the edits appear in red, and E-DataAid writes an annotation to the file for each deletion. This is to distinguish deleted data from the empty string (i.e., it is not uncommon for an experiment to use the empty string as one of its exemplars). By design, E-DataAid does not allow the deletion of rows or columns of data. To remove columns or rows from the display, columns may be hidden and rows may be filtered, refer to E-DATAAID: Reduce the Data Set  for more information. If reduction of the data set is not adequate, the spreadsheet can be exported as an E-Prime text file using E-DataAid’s Export command. Once exported, the text file can be modified in another application and re-imported using E-DataAid’s Import command. At some point, it may be necessary to change a variable’s name in the data file. 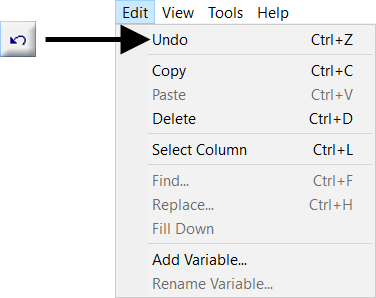 To rename a variable, select the column containing the variable and use E-DataAid’s Rename Variable command on the Edit menu to display the Rename Variable dialog. Enter the variable’s new name. The new name must begin with a letter, must be composed of only letters, numbers, periods, or underscores, must not exceed 80 characters, and must not already be in use. 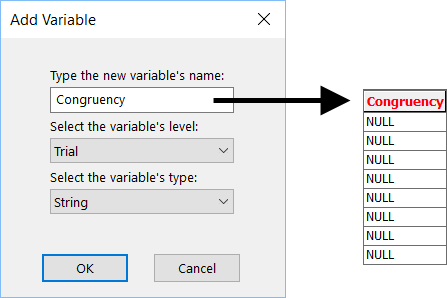 After entering the new name, click the OK button to rename the variable. With the exception of log- level names, the variable’s new name is considered an edit. Thus, the new name appears in red, and E-DataAid writes an annotation to the file describing the renaming. It may be necessary to add a variable for additional coding of the data (e.g., post-processing of verbal responses). Adding a variable to an E-DataAid file is akin to adding a column to the spreadsheet. To add a variable, use E-DataAid’s Add Variable command on the Edit menu to display the Add Variable dialog. 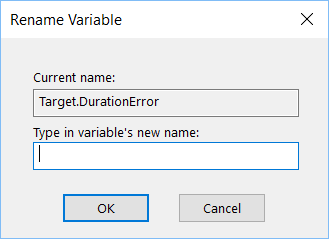 Enter the new variable’s name. The new name must begin with a letter, must contain only letters, numbers, periods, or underscores, must not exceed 80 characters, and must not already be in use. Select the variable’s level and data type (i.e., integer, float, or string). Click the OK button to add the variable. By default, E-DataAid places the new variable at the end (i.e., as the last column) of the spreadsheet. Adding a variable is considered a modification of the data file. Thus, the new variable’s name (Congruency) appears in red and E-DataAid writes an annotation to the file in reference to the action. E-DataAid automatically fills the cells in the new column with NULL. To enter values for the cells in the new column, simply click in the first cell and type a value. Depending on the defined level of the new variable, E-DataAid will fill in the values when appropriate, refer to SCRIPTING: Object Properties  for a description of the hierarchical nature of experiment data. E-DataAid allows the user to “undo,” or rollback, any edits made to the file from the time the file is opened until it is closed. To undo the most recent edit, use E-DataAid’s Undo command on the Edit menu. Undoing an edit also removes the annotation written to the file by E-DataAid. E-DataAid’s Undo command only reverses actions related to edits. The undo command does not act like a “general undo” to reverse other actions as in other applications, such as hiding or resizing columns. To undo an edit, click the Undo button, or use the Undo command in the Edit menu. Once a data file is closed, edit operations may no longer be undone.